WebMD has relaunched its Pregnancy app for the iPhone, and has integrated Apple's ResearchKit into the app to advance research on what contributes to healthy pregnancies and positive pregnancy outcomes. "Pregnant women are one of the least studied populations in medical research," said Director of Scripps Translational Science Institute Dr. Eric Topol. "The results of our Healthy Pregnancy Study —on the foundation of an exceptionally popular smartphone app —will ultimately provide expectant mothers, researchers, and health care professionals with new medical insights to avoid complications during pregnancy." As with the rest of Apple's ResearchKit-enabled studies, participants can opt-in to the study, and are asked to share information about their medication use, vaccinations they may have received during pregnancy, pre-existing conditions, blood pressure and weight change, diagnoses during pregnancy, as well as childbirth location, among other details. Biometric data that is inquired about includes sleep totals, and number of steps taken per day. In return, the app will give users visualizations of their data trends throughout pregnancy. As more data is collected, the app will also allow users to compare their data with that of other pregnant women who share their traits. Following the pregnancy, participants will also be asked to share information about additional factors, including provider insights and interventions, and birth size of the baby. Version 2.0 of WebMD's pregnancy app requires any iOS device running iOS 9 or later, and occupies 121MB of device storage. 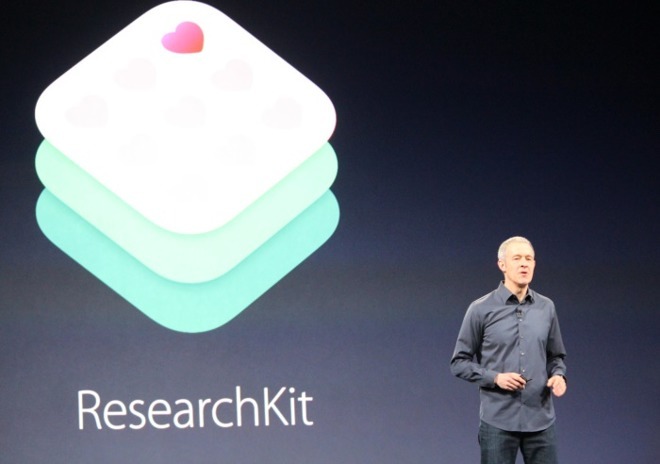 Apple's ResearchKit continues to gather accolades from the medical community. A recent study noted that ResearchKit is an extremely effective way to conduct medical research, with patient data collected from asthma sufferers via Apple's framework found to correlate with the results of similar studies using established data collection methods.